On our trip to the Maritimes at the beginning of June, one thing that impressed me was color. Painted houses in shades of blue, red, yellow, green and lots of white dot the landscape. I can imagine how pretty they would look in the snow. Doors were often in bright contrast to the house color and I took lots of photos of those. In Lunenburg I discovered that others before me liked all the colored doors for there is a wonderful poster of them for sale in the gift shops. While playing about in Picasa I somehow landed up with ALL the photos in one folder included in a mosaic. 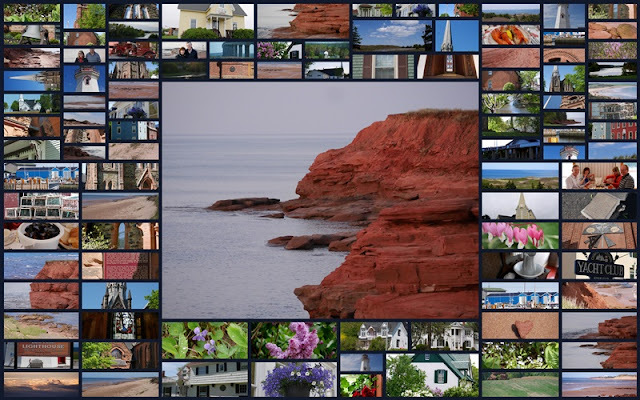 It looked fun and interesting, so I created something similar with photos of PEI. That's Cavendish Beach in the center, a place referred to in L.M. Montgomery's books. Passersby might have thought me a crazy tourist to be photographing peeling painted wood. I thought the photos would make nice backgrounds. Above I've combined them in a collage along with a photo of lobster pots. The East Point Lighthouse sits at the south east end of the island. I've been re-reading my old Anne books, and in Anne's House of Dreams, she refers to a ship rounding East Point. Don't you love it when fiction and real life collide? Such a pretty face on this fox. We were driving and stopped to look at the fox by the roadside. Tim snapped this photo along with several others. I'm linking up with Mosaic Monday, hosted by Judith of Lavender Cottage. 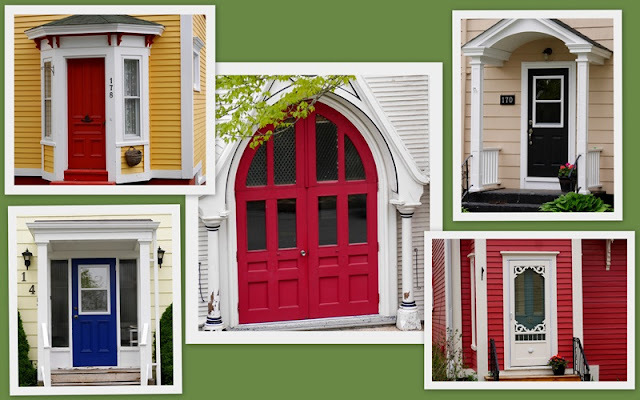 Lorrie, I love the doors you've shown and I especially love the double red doors with the Gothic arch. 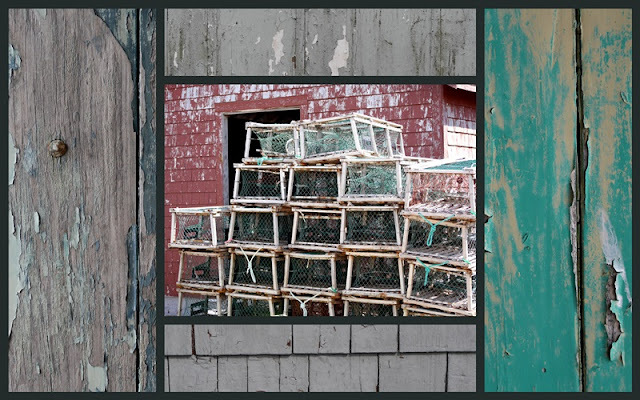 Your mosaic is intriguing and I love the collage of the lobster pots framed by old woods. You would find a lot of old woods around our place. Maybe I need to go out with a camera and look at them with Lorrie's eye! I love the colours of the houses, somehow blending together though quite different. This post is a photographer's dream. Beautiful shots. Love the pops of color and the weathered wood. Interesting collection of photos, Lorrie. I love a colorful front door. I like how you used the old siding pics to frame your collage…creative! Fascinating colours and textures, Lorrie! Your collages are very beautiful and the fox looks so intelligent. I do love a bright coloured front door (mine isn't....yet!) and brightly coloured trim on houses too. Love the mosaic with the lobster traps and chippy painted wood....nicely framed. Great capture of the fox! Love the shot of the fox! Wow! What a brilliant idea to photograph textures to use for background effect, I'll be keeping an eye out now myself. The fox looks cute, fluffy and very healthy but a scratch behind the ears would be out of the question. Great photo-art, Lorrie! Such cute little houses, jaunty ~ would make a good fabric picture! And I love Foxy. I don't think one of ours here would stop long enough to be 'snapped'. Oh I like that collage...busy, but telling the story well. Gosh, I just went out and scraped all my chippy paint away...I should have created a background! It must be fun to reread the Anne books with all the background you now have. great picture of the fox and I just love the peeling paint and lobster pots mosaic. Great idea!! Very cool mosaics, Lorrie! They make me want to visit PEI even more! The colorful doors are so fun. I love the peeling paint collage and that cute fox. I'm attracted to doors as well! They can say a lot about a house and I like when you can get away with bright colors. You saw a fox! Close up enough to get a very good photo! Lucky! Wow, gorgeous mosaic and images. I love the red door and the beautiful coastline shot. Enjoy your day and have a happy week! Your photos turned out well. I'm glad you enjoyed your trip to the Maritimes. That photo of the fox is fabulous and isn't he a cutie? The doors are interesting. I have a bright yellow door myself although I'm getting tempted to change it as we've had yellow for many years. Thanks for sharing and Happy Canada Day! Beautiful photos, Lorrie! The bright colored doors reminded me of Dublin. Ireland, where I saw many of the same. I love to visit land photograph lighthouses. The fox was so cooperative in having his photos taken! They are such beautiful animals. Love the mosaics and especially the colorful doors..we have a resident fox...just beautiful creatures! Hi Lorrie, Oh I love these colorful houses in your first photo!! They are beyond charming! :) I'm embarrassed to admit I've never read Anne of Green Gables. When I was growing up, I don't remember the other girls my age reading it. I loved the Little House on the Prairie series, and when I got a little older, I read Nancy Drew. As a young adult in my early 20's, I worked part-time in a bookstore for four years, and the Anne of Green Gables books were very popular. I must read them some day. That big mosaic must have been very time-consuming to put together; I'm very impressed. I love the mosaic with the peeling paint -- just a great idea! This looks like such an interesting part of the world to visit; I hope I can go someday. Love the fox and the doors. Yes, I love when fiction and real life do collide. I love the colored doors but mostly I love that RED house! Oh if only I were brave enough to do that, rather than red doors! What a beautiful vacation you had! Beautiful mosaic Lorri and what a pretty fox! I really enjoy your trip.Looks like the whole Maritimes is a charming place. i like those colorful painted houses.Yes, I too imagine how they are beautiful in the snow. The Lighthouse in the blue sky is shinning!Love the sweet face on the fox! Happy days for you and your family!